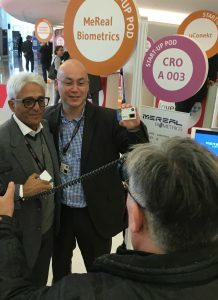 At the international trade fair trustech on the new technologies of confidence that is held at the Palais des festival, Patrick Partouche presents a smart card with digital recognition and sound. It is a smart card innocuous format that fits in the hand; It opens up prospects far beyond its material perimeter. French leader of the casinos, the partouche group said banco for a “revolutionary” biometric card in association with the company Mereal Biometrics. Patrick Partouche came to present it in person at the Trustech fair in Cannes. “This project is the fruit of thirty years of experience in casinos. It was born at the same time as online gaming,” said the P-dg of the casino group. Copyright © 2018. MeReal Biometrics Limited. All Rights Reserved.